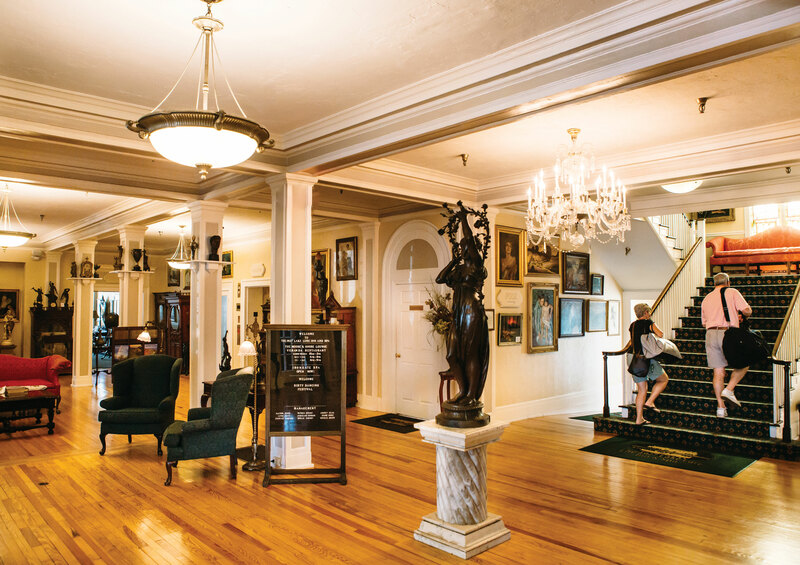 History abounds at this iconic resort in Hickory Nut Gorge. I imagine F. Scott Fitzgerald passing through these doors, as he did frequently between 1935 and 1936, and when I reach the gentleman with the waxed mustache and suspenders at registration, I nearly check my head for a bowler hat to ensure that I didn’t, in fact, fall decades into the past. Walking into this lobby — which is to say walking into the 1920s and ’30s — is also walking into the very beginning of the town of Lake Lure. This inn was built as the river was dammed. It opened its doors when the valley had filled with water and the town was incorporated, in 1927. The Mediterranean exterior of the hotel — stucco, arches, and red-shingled roof — reveals the original vision for Lake Lure: a resort town made in the image of the Lake District of Northern Italy. But the 1929 stock market crash sent investors fleeing, taking with them plans for an air field, a yacht club, and a zoo. What was left in this brand-new town, beside this brand-new lake, was the Arcade Building and the Lake Lure Inn. Now, nearly a century later, it still stands, equipped with a time machine and, of course, free Wi-Fi. I never knew I could be so excited about music boxes. George and Hope Wittmer, the inn’s owners, have collected these giant disc-playing machines from around the world. One of them, the nine-foot-tall, German-built Badenia II Orchestration, automates the sounds of a snare drum, a bass drum, a 44-key piano, a 52-violin-pipe organ, a cymbal, and a xylophone with its intricately punctured parchment scrolls. When it’s cranked, those original wood floors vibrate with music. As far as anyone knows, there are only two other surviving Imhof & Mukle Badenia II Orchestrations in the world. With key — not keycard — in hand, I head to my room. As I go, I read the antique signs — “Anyone placing an encumbrance on this balcony or stairway will be fined ten dollars” — and I let the newspaper clippings and photos on the walls lead me through a timeline of the Lake Lure Inn, from Calvin Coolidge’s visit in 1928 as he neared the end of his presidency, to Patrick Swayze and Jennifer Grey’s stay while filming Dirty Dancing in 1986, to the Party Rock fires that threatened the community last year. I find photos of Franklin D. Roosevelt outside the inn, and a placard dedicated to the 5,000 combat airmen who came to the inn for R&R in the 1940s before flying back into World War II. No one knows exactly why Elizabeth Parkenson Morse named the lake “Lure.” Her husband, Lucius, owned this land and flooded this valley and built this hotel. He gave Elizabeth naming rights, and some people believe she intended to offer the promise of good fishing. My theory, as I settle into my room, is that Elizabeth understood the pull, the draw of this valley. Behind the hotel, Chimney Rock juts into thin air; not far behind it, water tumbles down more than 400 feet at Hickory Nut Falls. Above the placid lake, clouds amble further from view. Everything surrounding the hotel whispers, Stop, look, relax. 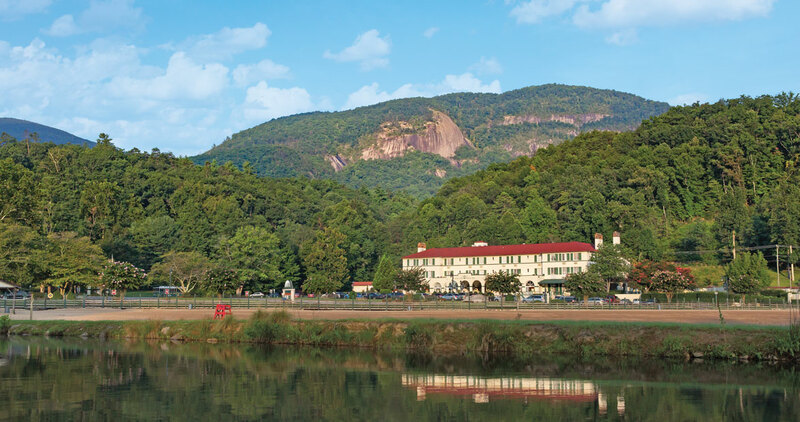 The 1927 Lake Lure Inn and Spa only amplifies nature’s advice. I could make my way down to the lakeside pool for a dip, or to the spa for a massage, or to the Moose and Goose Lounge for a drink, maybe an Old-Fashioned. But in this room, a few doors down from the Fitzgerald Suite, I’m slowly realizing that I could also stretch out on this king-size bed and rest awhile in the past.